All standard Klargester package pump systems are supplied with GRP/polyethylene chambers, pump(s), high-level alarm, pre-set automatic level control, non-return valve, discharge pipe and all connections. Klargester manufactures pumping chambers of various diameter and depths, with pumps, guide rails and control equipment fitted as per the client’s specification. Please contact us direct and we will be pleased to quote against your specific requirements. The information in this sales literature is, by necessity, brief. For more detailed technical literature and drawings regarding applications, installation, maintenance or specific options, please contact Klargester. We have both internal and field sales staff who will be pleased to assist. See Legislations for more information regarding regulations. Klargester package pump systems are designed for minimum maintenance. Klargester offers a full after sales service involving planned maintenance visits on the U.K. mainland. Prior to installation, there is a legal requirement to obtain permission from the appropriate agencies (including connection to a public sewer). Units are normally delivered by flat bed vehicle and cranage facilities should be available on-site for off loading. Installation is quick and economical, the unit requiring only a concrete base and surround. Comprehensive installation instructions are supplied with every unit. discharge of foul drainage should be taken as 150 litres per head per day for domestic use. The HillMaster range offers a competitive solution to the pumping requirements of both domestic and industrial applications. Often it can be preferable to keep civil work and installation costs down to a minimum but such economy should not mean any shortfall in quality. The Chiltern range is manufactured in tough polyethylene using advanced rotational-moulding technology, while the Pennine, Cairngorm and Mendip ranges are made from maintenance-free GRP. All units are engineered with the highest quality parts and fittings. The HillMaster24 range has been specifically designed to meet the requirements of Building Regulations Document H1 Foul Drainage. This regulation recognises the need for pump stations to have a 24hr storage capacity in case of a disruption in service (such as a power failure). This comprehensive range offers an advanced solution to larger domestic and industrial applications. For large-capacity flows (such as stormwater run-off from hard-standing areas), horizontal holding chambers are available in a comprehensive range of sizes. A septic tank or treatment system pumpset can be used to disperse settled effluent when a site has a high water table or adverse invert levels. Installed after the septic tank or treatment system and pumping settled effluent up to an inspection chamber, flow to the drainage system then takes place by gravity in the normal way. 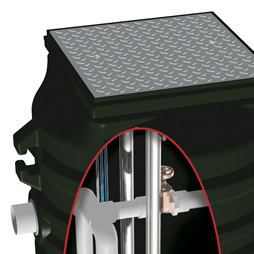 If the main sewer is accessible but at a higher level to (or some distance from) the domestic foul drain, then a domestic sewage pumpset may be used to pump unsettled sewage directly to the main. Whilst single pump units are acceptable for individual houses, it is recommended that twin pumping systems be used for multiple dwellings. Due to the amount of rainwater that can fall in a short time period, Surface Water run-off is often the most demanding of all applications, whether hard-standing or roof areas. Klargester offers a comprehensive range of packaged pump systems in both standard form or manufactured to bespoke specifications. Careful calculation of the run-off areas is essential when sizing these pump systems. Sewage, Effluent or Surface water?